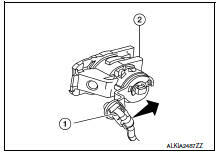 Remove inside handle assembly screws (A) and the inside handle assembly (1). 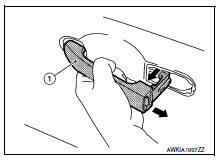 Remove door side grommet, and loosen screw that retains the front door outside handle bracket. 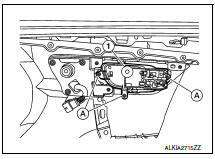 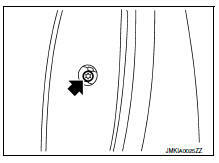 Reach in to separate door key cylinder rod (LH side) (1) from door key cylinder assembly (LH side). 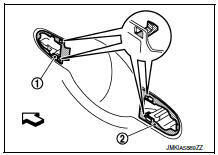 While pulling outside handle (1), remove door key cylinder assembly (LH side) or outside handle escutcheon (2) (RH side). When installing do not reuse front door outside handle bracket screw. 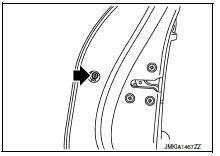 Always replace screw with new ones when removed. 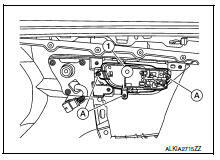 Remove inside handle assembly screws (A) and inside handle assembly (1). Remove door side grommet, and loosen screw that retains the rear door outside handle bracket. 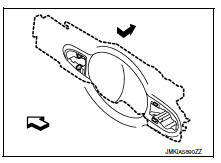 While pulling outside handle (1), remove outside handle escutcheon (2). 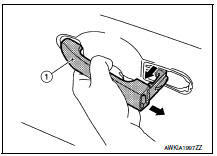 When installing do not reuse rear door outside handle bracket screw. 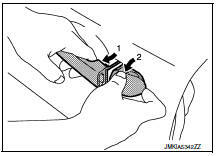 Always replace screw with new ones when removed.